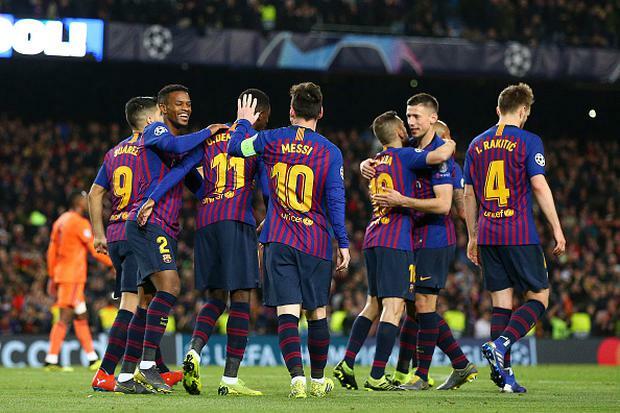 Lionel Messi scored two goals and set up two more as Barcelona moved into the Champions League quarter-finals with a 5-1 win over Lyon at the Nou Camp. Three weeks after the sides battled out a goalless first-leg draw in France, Messi opened the scoring with a 17th-minute Panenka-style penalty, and Philippe Coutinho then made it 2-0 just after the half-hour mark. Lucas Tousart pulled a goal back for Lyon in the 58th minute, before Messi added his second in the 78th and then teed up Gerard Pique and substitute Ousmane Dembele. While he could not match Cristiano Ronaldo's hat-trick in Juventus' triumph over Atletico Madrid on Tuesday, Messi certainly demonstrated his class in helping his team join the Italians in Friday's last-eight draw. As Barca exerted early pressure, Messi brought a good save out of Anthony Lopes with a curling effort and Ivan Rakitic's shot was blocked by Jason Denayer. Lyon registered their first attempt in the 10th minute, with Tanguy Ndombele drilling wide, before Lopes did well again, coming to bat the ball away when Messi brought down a Sergio Busquets pass in the box. Moments later, Luis Suarez went down in the area when challenged by Denayer, referee Szymon Marciniak pointed to the spot and, after the incident was checked by VAR, Messi coolly converted from 12 yards with a delightful chip. Lyon responded with a shot from Moussa Dembele that deflected wide off Clement Lenglet, before Lopes was hurt in a collision with Coutinho. The goalkeeper continued after having lengthy treatment, and was soon parrying a shot from Suarez. He was then beaten for a second time when Suarez controlled a pass from Arthur and laid the ball to Coutinho for a simple finish - a first goal since January for the club record signing, who was whistled at by Barca fans during Saturday's 3-1 LaLiga win against Rayo Vallecano. Three minutes later, Lopes, in tears, was substituted, with Mathieu Gorgelin coming on to replace him. Gorgelin then saw Suarez shoot wide, and did well to palm away a shot from Messi. Two minutes after the break Messi came close to scoring again as his goalbound effort was cleared off the line by Marcal. Lyon then enjoyed a good spell, with Nabil Fekir's shot swerving wide and Ferland Mendy's effort being tipped behind by Marc-Andre Ter Stegen. The resulting corner led to a delivery being sent into the box, Barca failed to clear the ball and it was rifled in by Tousart, with the effort being allowed to stand after another VAR check, for offside. As the visitors looked to sustain the momentum, Fekir fired off-target, and after Coutinho sent an effort into the side netting at the other end, Moussa Dembele headed wide. Messi then came back to the fore as Barca wrapped things up. First he bamboozled Marcelo with a turn and hit a shot that Gorgelin got a glove to but could not stop trickling in. Three minutes later Messi advanced with the ball from the halfway line into the box before playing it across for Pique to slot in. And five minutes after that, there was another dribble and pass from Messi, this time to Ousmane Dembele, who sent a shot in off Gorgelin's leg.